I hope all of you had a relaxing weekend; mine was full of short road trips and a little exploring. On Friday we headed to Cleveland to check out the West Side Market which is a magnificent collection of fresh produce, meats, seafood, cheese and pastries. Unfortunately, I left my camera at home by accident, but I will definitely remember it next time. Brian ate a saugage sandwich smothered with onion and peppers and I indulged in the most delicious falafel sandwich I have ever experienced. This is totally my type of shopping and really makes me want to move back to the area. After our lengthy stroll through the West Side Market, we dropped off some Mexican food and pastries to my dad. While on the subject of Mexican food, he told me about an elusive mouse that breaks into his office to indulge in hot sauce packets and Hershey Kisses out of his desk drawers. My guess it this mouse has some serious heartburn. After a little visit with the fam, we headed to dine at Michael Symon’s restaurant, Bar Symon. The décor, food and service were all perfect. Brian noshed on a whole lobster smothered in an orange beurre blanc. I discovered mac & cheese perfection with Michael’s Chicken, Goat Cheese and Rosemary blend. It was simply amazing. On Saturday, my lovely friend Brittani and I went to Canton, Michigan to explore Ikea and Home Goods. I picked up some cheap props and dined on greasy bar food at a local restaurant. Sunday morning was spent whipping up pancakes and doing some last minute shopping with my mom and John for a hospice fundraiser we have been working on for weeks. More details on this little project will hit MBA later this week. 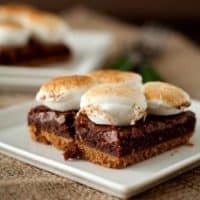 After a jam packed weekend, I settled in on Sunday afternoon and made my last recipe for S’mores week. 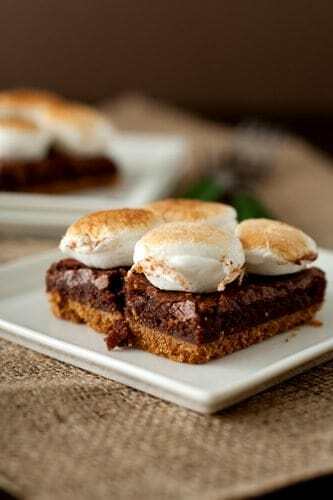 After I tossed around the idea of S’mores Ice Cream (which I may still execute at some point this summer) I ended up preparing S’mores Brownie Bars. I thought these were quite tasty; however, Brian was not too fond of them. He thought the graham cracker crust created a dry texture. I, on the other hand could eat graham cracker crust with a spoon, so I was all over this dessert. If you make this recipe, definitely report back and share your thoughts! Many thanks to Naomi of Baker’s Royale for pointing me in the direction of Alice Medrich’s brownie recipe, it was scrumdiddlyumptious. Preheat oven to 350 degrees. Line an 8-inch-square metal baking pan with foil and spray lightly with nonstick cooking spray. Combine the graham cracker crumbs, 6 tablespoons of melted butter in a bowl and mix until the crumbs are moistened. Press the crumbs evenly into the bottom of the pan and bake at 350 degrees for 7 minutes. Allow crust to cool on wire rack. 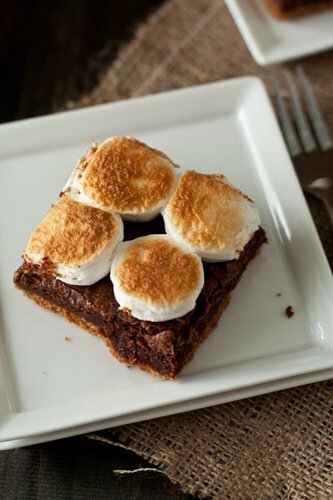 Turn the oven temperature up to 400 degrees and prepare the brownie layer. In top of a double boiler set over barely simmering water, or on low power in a microwave, melt butter and chocolate together. Stir often, and remove from heat when a few lumps remain. Stir until smooth. Stir in sugar, vanilla and salt. Stir in eggs one at a time, followed by flour. Stir until very smooth, about 1 minute, until mixture pulls away from sides of bowl. Scrape batter into prepared pan and bake for 18 minutes. Let cool completely, then lift out using the foil and place brownies onto a broiler safe pan. Move your oven rack about 6 inches from your broiler and preheat your broiler to low. Layer marshmallows (sticky side down) across the top and toast under the broiler until golden, (watch this like you have never watched anything before - it can burn QUICK), about 2 minutes. Cool and cut into 16 (two inch) squares.